This mission was entrusted to Ideogram Design. Once briefed, the designers started the design of the logo. After a long research on the graphic art, a dozen projects were presented to the management team in charge of the Master. A graphic chart was elaborated out of the chosen logo, templates were elaborated for stationary (business cards, letterheads...) and computer models for office software (word, powerpoint…). 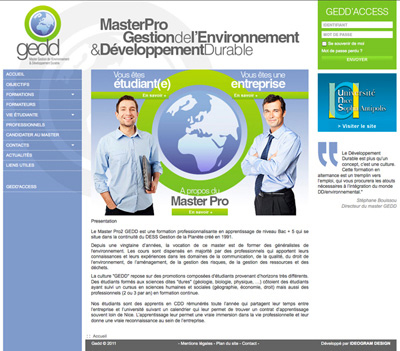 The second phase of the reorganisation consisted in an entire rework of the GEDD’s website. This task was given to Ideogram Design based upon its experience in graphic design and web development for both clients and servers systems. The first part for the general public. The purpose of the website is to inform students but also companies who would be interested in young graduates in this promising activity. So that the website lives through its users, the students have the possibility to edit the content directly on the website. They also have the possibility to add news. Every change brought by students has to obviously be approved by the teachers, administrators of the website. The second part highlights more the spirit of GEDD and its notion of group cohesion. It’s a social network like facebook but only for GEDD members. It allows former and new students to share information (news, connections, job offers,…). The functionalities integrated make of it a true technological tool, entirely developed in AJAX. Surveys, events, classified ads, integration of videos issued from different platforms (Youtube, Dailymotion,…) come with the users messages to which anybody can add its own comment.